If your company’s sign isn’t catching people’s eyes — drawing them in and captivating their attention, wondering what it is that you’re selling — then you’re just not doing yourself any favors. A quality sign should be well-lit, big enough to see and read from a distance, and easy to understand from the perspective of an average customer. Other design considerations aside, if you at least have those things going for you, then your business is bound to benefit. All too often, companies hold themselves back with poorly designed signage. At Commonwealth Sign Company, our Louisville sign makers believe that your business deserves better than a poorly made sign. After all, you’ve worked hard to create everything that your company is today, so why squander everything with a sign that barely represents who you are and what you believe in? 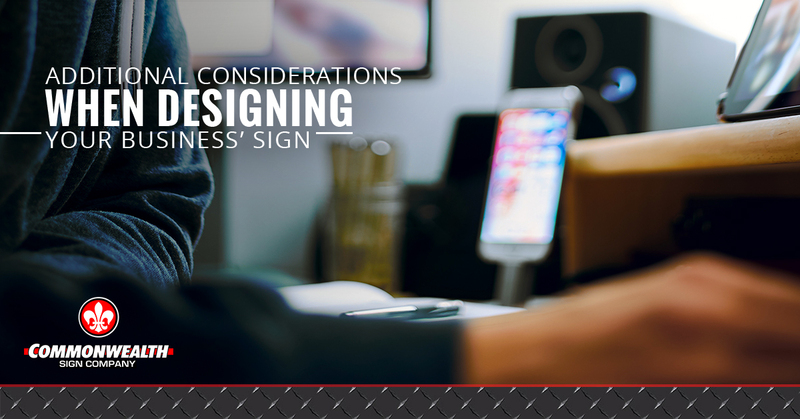 To further touch on our last blog post about quality sign design, our building signage experts are going to cover a few more considerations that you should keep in mind when getting a sign for your business. Learn more about Louisville building signs by contacting Commonwealth Sign Company today! Does Your Landlord Have Any Restrictions? If you’re leasing your property — as many business owners do — you’ll want to make sure of any possible restrictions on sign design before we start going crazy with it. There should be certain criteria (of varying detail) contained within your lease, including items like the type of sign, size placement, color, illumination output, and so forth. Don’t have us design an excellent sign for you, only to re-do it because you didn’t check for any landlord-based restrictions! As you can see, design considerations don’t solely come down to colors and font choice. You’ll want to make sure that your sign design is within the regulatory code of your city, county, and even township. Based on your property classification, there will be relevant zoning guidelines that affect your design limitations. Can your sign be easily accessed by one of our maintenance technicians? Chances are, you’ve seen it before — various letters on signs do burn out, often causing hilarious spelling. If your company uses an illuminated sign, you’ll want to make sure that routine service and maintenance are performed by experts you can trust. Sounds like a job for our sign company in Louisville! If you use an illuminated sign for your business, how will it be turned off? Manual or automatic switches are what you’ll need to choose from. Perhaps you’ll want to keep your sign turned on indefinitely, which may or may not be acceptable depending on the signage code in your area. If your sign is set to turn off automatically, this can be done through a time clock or a light sensor. From custom neon signs to restaurant signs and other building signage in Louisville, Commonwealth Sign Company is ready to work with your business to help you find the very best commercial sign solutions. Take your next step to advertising success and get in touch with our signage professionals today! Light Up Your Business Today!